Deltas have long played an important role in human history. These fertile areas where rivers flow into large bodies of water have served as fishing, farming, and living sites. Of the great deltas around the world, perhaps none has had a greater role in civilization than the delta of Egypt's Nile River. Greek historian Herodotus (c. 484–c. 425 B.C.E. ), considered by many as the "Father of History," studied this great geologic feature. He is credited with coining the term "delta" for this type of landform because its triangular shape reminded him of the Greek letter ∆ (delta). A delta is a body of sediment deposited at the mouth of a river or stream where it enters an ocean or lake. Unlike other landforms affected by running water, a delta is not created primarily by water cutting into or eroding the landscape (erosion is the gradual wearing away of Earth surfaces through the action of wind and water). Water does not tear down a delta; instead, it builds up a delta. A river creates a delta by laying down sediment or rock debris such as gravel, sand, silt, and clay that it has picked up and carried along its course. Alluvium (pronounced ah-LOO-vee-em) is the general term for sediment deposited by running water. A river's depth, its width, and its speed determine how much sediment it can carry. The Mississippi River flows at an average surface speed of about 2 miles (3 kilometers) per hour. Yet it drains between 1.2 and 1.8 million square miles (3.1 and 4.6 million square kilometers), which is more than 40 percent of the total area of the continental United States. Over the course of a year, it moves an average of 159 million tons (144 million metric tons) of sediment. In general, deltas are similar in shape to another type of landform deposited by flowing water, alluvial (pronounced ah-LOO-vee-al) fans. A delta may be divided into three main zones: upper delta plain, lower delta plain, and subaqueous (pronounced sub-AY-kwee-us) delta plain. The upper delta plain is that part of the delta that is farthest inland. It lies above the high tide mark and is not affected by the action of waves or tides. (Tide is the periodic rising and falling of water in oceans and other large bodies of water in response to the gravitational attraction of the Moon and the Sun upon Earth.) The river or stream that forms the delta begins to divide in the upper delta plain into smaller channels called distributaries, which carry sediments toward the delta's edges. Immediately seaward of the upper delta plain is the lower delta plain. It occupies the area between high and low tides and, thus, periodically lies underwater. The landscape is affected by the action of distributaries, tides, and waves. Finally, the subaqueous delta plain is that part of the delta that lies below the low tide mark and, as a result, lies completely underwater. The tug of war between land and water determines a delta's shape. It is a battle that pits the strength of a river's flow and the amount of sediment it carries against wave and tidal currents. Deltas build outward from a coast only if the slope from the shore is gentle and ocean currents are not strong enough to carry away the sediment deposited by the river. The three main varieties of deltas based on shape are the arcuate (pronounced AR-cue-et), the bird's foot, and the cuspate (pronounced KUSS-pate). A fanlike deposit of sediment that forms where an intermittent, yet rapidly flowing canyon or mountain stream spills out onto a plain or relatively flat valley. The coarse sediment rolled along the bottom of a river or stream. A fine, horizontal layer of clay and silt deposited beyond the edge of a delta. Dissolved substances, the result of the chemical weathering of rock, that are carried along in a river or stream. 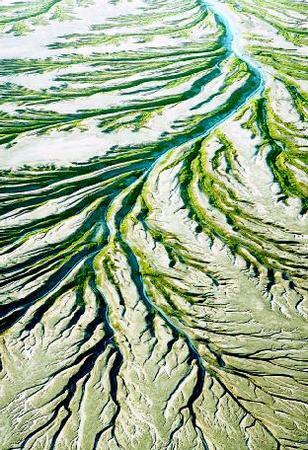 The channels that branch off of the main river in a delta, carrying water and sediment to the delta's edges. An inclined layer of sand and gravel deposited along the edge of a delta. The fine-grained sediment that is suspended in the flow of water in a river or stream. A horizontal layer of coarse sand and gravel deposited on top of a delta. Arcuate deltas are the commonest form of delta. They are fan-shaped, with the wide portion of the fan farthest from the mainland. Crossed by many short, well-defined distributaries, these types of deltas are composed of relatively coarse sediments. Wave and river activity are fairly well balanced. The seaward edge of the delta is rather smooth because strong waves push the sediment back against that edge. The Nile Delta is an example of an arcuate delta. Where the action of waves is weak and that of a river is strong, an irregular-shaped delta forms that extends out into the water well beyond the local shoreline. Resembling the spread claws of a bird's foot, this type of delta is called a bird's foot delta. Fine sediments and shifting distributaries mark this river-dominated delta. Bird's foot deltas are not common along ocean coasts because the action of ocean currents and waves is often as strong if not stronger than that of rivers. The Mississippi Delta, on the Gulf of Mexico, is a bird's foot delta. Cuspate deltas form where a river drops sediment onto a straight shoreline with strong waves that hit head-on. The waves force the sediment to spread outwards in both directions from the river's mouth, making a pointed tooth shape with sides that curve inward. Few distributaries are found in cuspate deltas. The Tiber Delta in Italy is a classic example. Deltas are found throughout the world, except at the poles. 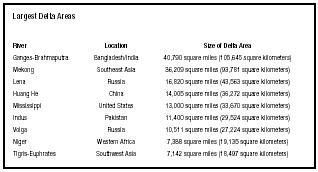 Most of the world's great rivers—the Amazon, the Ganges-Brahmaputra, the Huang He, the Mississippi, the Nile—have built massive deltas. All have a few characteristics in common: they drain large land areas, they carry large quantities of sediment, and they empty at coasts that are geologically quiet (no earthquake or volcanic activity). Deltas are geologically young landforms. Present-day deltas began forming no more than 7,000 years ago, when sea levels stopped rising after the last ice age ended. Over Earth's history, as sea levels have risen and fallen in response to glacial periods, deltas have formed and have been covered over. The current deltas of some rivers are built on the remains of numerous deltas stretching back millions of years. Yet their surface can change rapidly and significantly. The key to the creation of a delta, and its continual formation, is a river and the sediment it transports. more particles. This water quickly concentrates into channels, which then become streams that flow into rivers. The amount and size of the material that a river can transport depends on the velocity, or speed, of the river. A fast-moving river carries more sediment and larger material than a slow-moving one. A river that is turbulent or agitated can also lift and carry more rocks and sediment than one that flows gently. The sediment load in a river consists mainly of two parts. The first part is the coarse material that moves along the bed or bottom of the river. This is known as the bed load. As it is carried along, this coarse sediment acts as an abrasive, scouring and eating away at the banks and bed of the river. The river then picks up any newly loosened and eroded material. The second part is the fine-grained material that is suspended in the flow of water as the river moves downstream. This is the suspended load. Rivers also carry a dissolved load. These dissolved substances are the result of the chemical weathering of rock, which alters the internal structure of minerals by removing or adding elements. A river will continue to carry its load as long as its velocity remains constant or increases (if it increases, it can carry an even larger load). Any change in the geography of the landscape that causes a river channel to bend or rise will slow the flow of water in a river. As soon as a river's speed decreases, it loses the ability to carry all of its load and a portion will be deposited, depending on how much the river slows down. Particles will be deposited by size with the largest settling out first. When a river meets the standing water of an ocean at a coast, it quickly loses velocity and the heaviest particles drop out. The fine suspended load may be carried farther out into the water before it settles out and sinks to the bottom. Sediments deposited in a delta are laid down in layers known as beds. Bottomset beds are those nearly horizontal or flat layers of fine clay and silt that form underwater farthest from the mouth of the river. Closer to the mouth, yet still underwater, are foreset beds of sand and gravel that slope steeply down toward the bottomset beds at an angle up to 25 degrees. Thin, horizontal layers of coarser sand and gravel that are deposited on the surface of the delta are topset beds. As a delta increases in size and advances farther out into the water, the topset beds cover the foreset beds, which in turn cover the bottomset beds. As more sediments are brought by the river to the delta, especially in times of flooding, the main river may become choked with sediment. When this occurs, the river branches into distributaries, finding the least resistant path to the shoreline. When sandy deposits block the distributaries, they then become inactive, and smaller, active distributaries branch off. As the process continues, distributaries constantly shift position across the surface of the delta. The Huang He is the second longest river in China. It begins in the highlands of Tibet and flows eastward for 3,000 miles (4,830 kilometers) before it empties into Bohai Bay. Along its course, it drains more than 290,000 square miles (751,100 square kilometers) of land area. It is the muddiest river in the world, carrying more sediment than any other. Each year, it transports an estimated 1.6 billion tons (1.45 billion metric tons) of sediment. 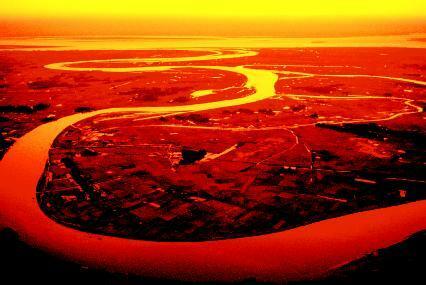 Because that sediment colors the water of the river yellow, the river is also known as the "Yellow River." Much of that sediment is deposited in a delta that has formed at the mouth of the Huang He. It increases in size by as much as 20 square miles (50 square kilometers) each year. A delta is often a patchwork of marshes, swamps, lakes, and tidal flats (muddy or marshy areas that are covered and uncovered by the rising and falling tides). During the normal flow of the main river in a delta, all the water is guided out to the ocean by the active distributaries. Sediment is deposited in these channels and immediately offshore to them. The areas between the channels receive no sediment. In times of flood, water flows out of the distributaries over the delta surface, depositing sediment. Coarse sandy particles are deposited first, producing low ridges or embankments along the banks of the distributaries. These are known as natural levees (pronounced LEH-veez). When the balance between a river and ocean is shifted, the delta will either enlarge or decrease in size. If waves and currents are not strong enough to carry most of the sediments away, those sediments will collect over time to form landmasses laced with distributaries that extend a delta farther and farther out to sea. Floods and periods of heavy rain bring more sediment to a delta, building it up. Periods of drought, however, have the opposite effect. Human activity may also affect the size of a delta. If forests or similar types of land upstream are cleared, increased erosion may occur, sending more sediment downstream to build up a delta. If a dam is built on or water is otherwise diverted from a river, the velocity of the river and the amount of sediment it can carry will decrease. Consequently, the delta at its mouth will shrink. The combined Ganges and Brahmaputra Rivers have formed the largest delta in the world, the Ganges River Delta (sometimes called the Ganges-Brahmaputra Delta). Approximately 220 miles (345 kilometers) wide, the delta covers an area of roughly 40,790 square miles (105,645 square kilometers). Almost 1.1 billion tons (1 billion metric tons) of sediment is discharged from these rivers annually. This has produced the Bengal Fan, a deposit of sediment on the floor of the Bay of Bengal that stretches outward 1,865 miles (3,000 kilometers) in length and 620 miles (1,000 kilometers) in width. In places close to shore, the Bengal Fan measures up to 7.5 miles (12 kilometers) thick. A glacier at about 22,100 feet (6,735 meters) in the Himalayan Mountains is the source of the Ganges River. The river flows southeast across India to combine with the Brahmaputra in Bangladesh. The Brahmaputra River has its source in Tibet along the northern slope of the Himalayan Mountains. From there, it flows across the Assam Valley of India into Bangladesh. The rising Himalayan Mountains provide much of the sediment load of these two rivers. In Bangladesh, the rivers join to form the Padma, the main channel to the sea. The united rivers branch into many distributaries, forming the vast and fertile Ganges River Delta. The delta region covers roughly 25 percent of India's total territory. The delta's southern portion is covered largely with a swamp forest roughly 6,525 square miles (16,900 square kilometers) in area. Known as the Sunderbans, it is home to the endangered Royal Bengal tiger. The waters of almost half a continent flow through the Mississippi River. About 159 million tons (144 million metric tons) of sediment—70 percent of which consists of clay, silt, and fine sand—are carried by the river annually. Where it empties into the Gulf of Mexico in southern Louisiana, the river slows and drops its sediment load, forming the Mississippi Delta. The giant bird's foot delta, featuring a large middle toe, marks the seaward growth of land into the gulf. The delta, the most fertile area of Louisiana, covers about 13,000 square miles (33,670 square kilometers), roughly 25 percent of the state's land area. It measures about 12 miles (19 kilometers) long and 30 miles (48 kilometers) wide. In the delta, the Mississippi River breaks into a number of distributaries, the most important of which are the Atchafalaya (pronounced uh-cha-fuh-LIE-uh) River and the Bayou Lafourche (pronounced BYE-oo luh-FOOSH). The main river continues southeast through the delta to enter the gulf through several mouths, including Southeast Pass, South Pass, and Pass à Loutre. sea, taking a shorter and more energy-efficient route. The Mississippi River has done this at least five times in the last 5,000 years. The Okavango (pronounced oh-kah-VANG-go) Delta is the world's largest inland delta. Instead of flowing into an ocean or a large lake, the Okavango River spreads over 6,000 square miles (15,540 square kilometers) of the Kalahari Desert in a maze of intricate waterways and reed-lined channels. This creates a diverse ecosystem that supports the greatest concentration of birds, animals, and fish in Africa. Rain falling on the highlands in central Angola forms the Cubango River. It flows through Namibia as the Kuvango River before finally entering Botswana as the Okavango River. Each year, some 2.9 trillion gallons (11 trillion liters) of water carrying more than 2 million tons (1.8 million metric tons) of sediment enter the delta, which occupies a depression that contained a large prehistoric lake. months later in the southern section. As a result, water rises in the north as it recedes in the south during summer, and rises in the south as it drops in the north during winter. Despite this latter drop, the north remains wet all year. The nature of the annual floods is gentle. Plains and islands disappear under water, then reappear in an ever-changing landscape. "Delta." Kent National Grid for Learning. http://www.kented.org.uk/ngfl/rivers/River%20Articles/delta.htm (accessed on August 26, 2003). "Deltas." Department of Geological Sciences, Salem State College. http://www.salem.mass.edu/~lhanson/gls214/gls214_deltas.html (accessed on August 26, 2003). 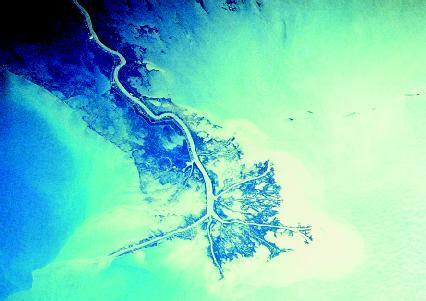 "Ganges River Delta (image)." Earth Observatory, NASA. http://earthobservatory.nasa.gov/Newsroom/NewImages/images.php3?img_id=4793 (accessed on August 26, 2003). "Major Deltas of the World." Department of Geology and Geophysics, University of Wyoming. http://faculty.gg.uwyo.edu/heller/Sed%20Strat%20Class/Sedstrat6/slideshow_6_1.htm (accessed on August 26, 2003). 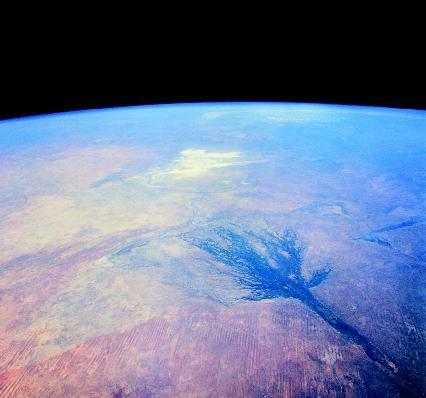 "Mississippi River Delta (image)." Earth Observatory, NASA. http://earthobservatory.nasa.gov/Newsroom/NewImages/images.php3?img_id=9304 (accessed on August 26, 2003). "Okavango Delta and Makgadikgadi Pans, Botswana (image)." Visible Earth, NASA. http://visibleearth.nasa.gov/cgi-bin/viewrecord?9152 (accessed on August 26, 2003). "When Rivers Run Into the Ocean." Missouri Botanical Garden. http://mbgnet.mobot.org/fresh/rivers/delta.htm (accessed on August 26, 2003). How does the Delta affect the nature around it as well as us humans? What are the effects on its surrounding habitant? I really enjoyed and apriciate the information on this site. It really helped me with my project and i will source you because you deserve the credit. I think this is a brilliant website with excelent information. I think You should have more diagrams though, because I wanted and needed a diagram and there were basically none. Thats the only thing that I think you should change. Again thanks for the information. It is right on my level! 1)how does a river change at its delta? 2)how does rivers delta change the surrounding land? This helped me with my science landform project thank you i couldn't have gotten a good grade without it.